About 18 months have passed since I last wrote about the development of the old Hakoah Club site (and neighbouring properties) in Hall Street. The new site now houses some interesting restaurants and eateries including A Tavola Pasticceria Papa, Da Orazio and Ribs & Burgers. There is also Gelato Messina (where there are always queues) and a Harris Farm Market. All of this retail space supports the new hotel and apartments (Adina and Boheme) – which are part of the package. The architectural design of Boheme is OK, though it doesn’t really do all that much for me. I can see a building like this perched on a hill somewhere in the Northern Beaches area of Sydney. But I don’t really see how it blends into the Bondi art-deco urban landscape. It seems to be quite out of place here to me, although the price tag for such real estate is unfortunately not out of place here – these days. Boheme was apparently designed by “interior architects” Bates Smart. 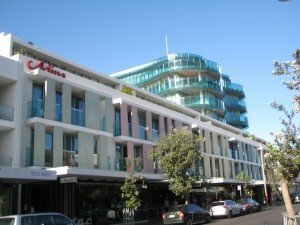 Still, although I was a little sad to see the demolition of the Hakoah Club (and a bit of Bondi history go with it), I’m trying to embrace this new Hall Street development as part and parcel of urban change. I can see how these additions and other recent changes to Hall Street could be attractive to Bondi visitors and tourists, but maybe less so for long-time locals! Personally, I haven’t spent a lot of time there, but I have ducked into Harris Farm late at night here and there to do a bit of shopping, in quiet time, which has been convenient. It appears that others, like Paul Paech, have also written about this change to Hall Street.